In this study, 4-pole type yoke hybrid electromagnet is modeled with respect to motion dynamics of the system. The hybrid electromagnet inherently has a nonlinear characteristic and from the point view of controllability, it is unstable. This paper concerns the design of robust controller using first order integral sliding mode control method. Thus, the system becomes stable and robust against parametric uncertainties, nonlinearity, unmodeled uncertainties and external disturbance. Magnetic levitation system includes sensors that only measure the air gap. In order to estimate other states of the system, the full order disturbance observer is designed and integrated into the control loop. The estimated disturbance value is factored by the appropriate conversion gain and added to the input signal of the plant. The efficiency of control algorithm will be given in the paper by computer simulations.
.	Y. Yakushi, T. Koseki and S. Sone, "3 degree-of-freedom zero power magnetic levitation control by a 4-pole type electromagnet", International Power Electronics Conference,vol.4, pp.2136-2141, April 3-7, 2000, Tokyo, Japan.
.	K. Erkan, B. Okur, T. Koseki, and F. Yigit, “Experimental evaluation of zero-power levitation control by transfer function approach for a 4-pole hybrid electromagnet,” 2011 IEEE International Conference on Mechatronics, pp. 23–28, Apr. 2011.
.	Vadim Utkin, Juergen Guldner, Jingxin Shi, Sliding Mode Control in Electro-Mechanical Systems, Second Edition, CRC Press, 2009.
.	Katsuhiko Ogata, Modern Control Engineering, 5th Edition, Prentice Hall, 2009.
.	J.-H. Lee, P. E. Allaire, G. Tao, and X. Zhang, “Integral sliding-mode control of a magnetically suspended balance beam: analysis, simulation, and experiment,” IEEE/ASME Transactions on Mechatronics, vol. 6, no. 3, pp. 338–346, 2001.
.	Zhen Gang Sun; Cheung N.C; Shi Wei Zhao; Wai-Chuen Gan, Integral sliding mode control with integral switching gain for magnetic levitation apparatus, 2009. PESA 2009. 3rd International Conference on Power Electronics Systems and Applications, 2009.
.	Manabe, S.“Coefficient diagram method”, 14th IFAC Symposium on Automatic Control in Aerospace, Aug. 24-28, 1998, Seoul, Korea, 199- 210. (1998). ISNAD ERTUGRUL, Hasan Fatih . "First Order Integral Sliding Mode Control Of The Magnetically Levitated 4-Pole Type Hybrid Electromagnet". 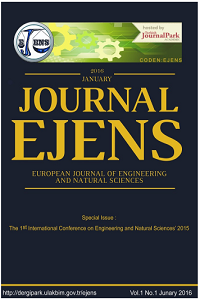 European Journal of Engineering and Natural Sciences 2 / 1 (February 2017): 79-86.